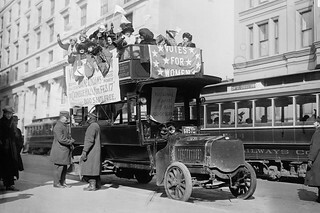 Much of the discussion about women’s suffrage tends to focus on England, the Pankhursts, and their militant tactics, but the battle for the vote raged just as vehemently in the United States. If you follow my Twitter account, I spent most of the weekend (sorry Dowager Countess!) 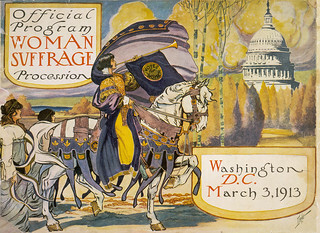 retweeting links to articles and pictures of the participants and artifacts from the Woman Suffrage Parade held exactly 100 years ago on Sunday and those who participated in its recreation. 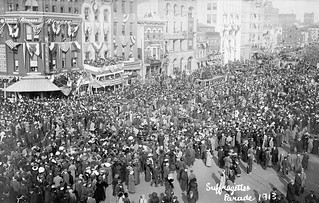 Though the 1913 parade was not without its own external and internal strife (namely, the abuse hurled at the women as they marched in Washington, and the controversy raised when black women asked to participate, much to the horror of many white Southern women delegates, respectively), the 2013 parade was a testament to how far we’ve come on issues of gender and race since then. It looks like there’s ONE HIKER on that map. I was very proud to be in the film “Iron-Jawed Angels” which was shot in Richmond and Petersburg VA. A number of the “angels ” were at the march on Sunday. Alice Paul was, at first. not in favour of having African American women march, but after someprerssure from the Women’s National Party”, she changed her mind. She leraned most of her non-violent protests from the Pankhursts when she was in London. The women were finally arrested for “blocking traffic” in front of the White House with Pres. Wilson’s approval. They were sent to the Occoquan Work House, where conditions were terrible and some went on hunger strikes. Alice Paul was force fed, along with Lucy Burns and others…..this led to one paper calling them “Iron-Jawed Angels” and many people changed their minds about suffrage for women. Some women in the western territories had the right to vote….the UK passed suffrage in 1918 ( but only for women who were 30 and owned property ) The US followed in 1920……finally. The film “Iron-Jawed Angels” was produced by HBO and stars Hillary Swank as Alice Paul and Francis O’ Connor as Lucy Burns, Vera Famiga and Angelica Houston are also in it. Of all of the film and theatre work that I have done, this project was the most profound. I learned so much ( and my hobby is history ) If you can find it, do see it…….it was shown this weekend in honour of Women’s History Month at the Archives. Wish I had seen you at the march…it was cold and windy but I thought of the women standing in front of the white House 24/7 and all that they went through to get the vote for us. BTW- the first Women’s Conference was held in 1848 in Seneca Falls…..Susan B. Anthony spoke on the “Rights of Woimen”- it took almost 65 years to get that vote! Great pictures and information! I’ve been doing a lot of research into the suffrage movement in Georgia, as well as the perplexing anti-suffrage movement among some women there (though I’m sure it happened in other states too). 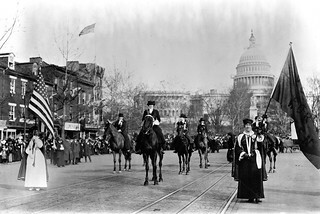 Reading some of the anti-suffrage rhetoric from both women and men is infuriating, but it’s an important reminder of all that suffragist did so that women have a voice in government. It is interesting to note that many people felt that the suffrage movement was made up of upper class women….women who worked did not have the time to picket, rally, etc. Their lives were taken up by factory work, farming, children and they had little free time even if they wanted to join the movement….some couold not read or write. There is a scene in the film where we ( the suffragists ) are handing our leaflets at a factory. 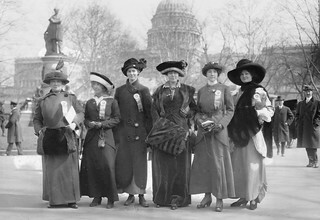 The women are waloking past us, saying they are too busy….one of the women finally remembers the Triangle Waist Factory fire and that maybe if women could vote, there wouyld have been fire escapes….that woman who was called Rosa ( she was from Poland ) became Rose Wislow, a leader of the NWP.